NOTES: Cutting Edge CEC48446 conversion set (good luck finding one) and CED 48238 for decals. Wasn’t bad at all…honest…hey where ya going? The HE-111 was originally developed as an airliner from the record breaking HE-70. First flying in February 1935, it would begin service with Lufthansa in 1936. However, development of the airliner would also coincide with development of the Heinkel as a medium bomber. 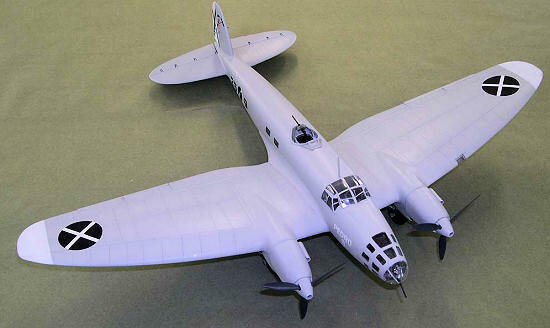 The third prototype would be designated HE-111A and put into production. After ten were manufactured, it was determined to be unsuitable due to poor performance and low power and all would be sold to China, with disastrous results. Five HE-111As would fly their first mission with their lower dustbin gun positions lowered. The drag slowed then to the point that when Japanese fighters found them, three were immediately shot down. The Germans would continue to develop the HE-111 in the bomber role. With more powerful engines, they would debut during the Spanish Civil War in their full war guise and gain notoriety for histories first noted “terror bombings” of Guernica in April 1937. The HE-111 proved to be a fast aircraft frequently outrunning the fighters of the day and upon entering WWII, would be the backbone of the Luftwaffe bomber force. This confidence would be shattered by Hurricanes and Spitfires in the skies over southern England in autumn 1940. However, it would prove to be a versatile aircraft and would continue to serve as a bomber, torpedo bomber, glider tug and transport until nearly the end of the war. The Monogram kit is a delight to build. I’ve built 2 before this and I enjoyed both. It was a model I had wanted for a long time in 1/48 scale. The rather large box holds four sprues in finely molded light gray styrene along with one in clear. The instruction booklet is clear and concise and this boxing has options for two torpedo bombers and a standard bomber. I didn’t think to take pics of the Cutting Edge conversion set before I started this. 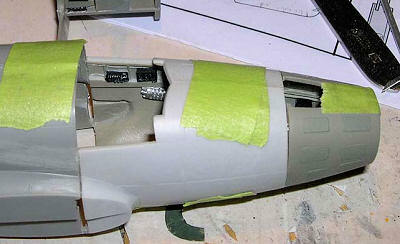 However the set consists of all the parts necessary to replace the nose from the rear cockpit bulkhead forward along with clear resin canopy parts and windows. It also contained parts to rebuild the bottom of the plane to remove the ventral gun position and replace it with the older style “dustbin” gun position, complete with flooring. And finally it contained replacement leading edges for the wings and enough parts for both the B and J variant engines. Be sure to study your references for the engines (if you can find any-they are few and far between for the early HE-111s) as it seems there are some different configurations. With hammer and chisel and hacksaw in hand, construction begins. One of the early issues I ran into was a pretty serious warp in the resin starboard nose half. I began by following Swanny’s advice by making my cut just forward of the panel line at the cockpit. The opening for the glass remains along with about 1/8” of styrene forward of it. Better here to cut too long of course. I tack glued the resin cockpit floor with just the forward and rear bulkheads to use as a gauge in fitting the resin nose parts. Once I had the port side where I wanted it, I secured it into place. I use cheap gel superglue for this stuff as it gives me some time to work with it and also fills any gaps that might come up. I then fitted the warped piece for length, dipped it in boiling water and wrapped it round again. It didn’t come out quite perfect but a bit of filler later cleaned it up well. Now that I had two fuselage halves for a long nosed HE-111, it was time for the cockpit. I popped the forward bulkhead off the cockpit floor and built up the interior. The parts were cleanly cast and the delicate parts well protected on the stubs. Cutting Edge did a pretty nice job on the instructions here. Three black and white photographs of the cockpit show where all those fiddly bits go. They also provided good pics of the bombardier’s tunnel and those bits went in at the same time. Be sure to dry fit often so you don’t have things in the way of other things when you’re done. It was time for the next major surgery. The lower aft section of fuselage had to be replaced for the dustbin gun position. Cutting Edge made this pretty easy by making a piece that fits into a hole that is cut along panel lines on the bottom. As usual, I cut this a bit small and sand the opening to fit the replacement parts with the fuselage ha lves taped together. Once I got a nice snug fit out of it I undid my tape, fit the cockpit into place along with the aft bulkhead and resin flooring and glued my fuselage together. The most interesting part of this conversion set for me was the clear resin parts. They are notably thicker than styrene but do a very nice job of looking the part when they’re installed. Cutting Edge provides a sheet of vinyl canopy masks which was awful nice of them with all the windows on this thing. The sheet also has interior masks so you can paint the inside RLM 02 as well. The only clear part they didn’t provide for this conversion was the very tip of the nose where the gun goes. This was to be sawed off the kit part. Interestingly, they did not provide a set of masks for this which was a shame. It’s a tough pa rt to mask and I ended up touching up the frames with a brush. The one problem I had with the clear resin in this set was the canopy. The front glass was almost flat on mine and it should’ve peaked at the center. Again, boiling water was the answer here but I had some concerns about stressing the part and it could’ve been pulled out a bit farther. 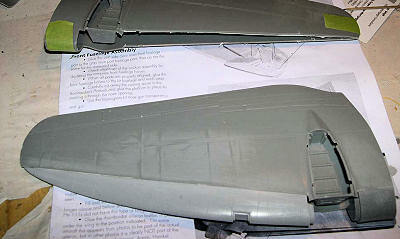 Also oddly enough, the clear nose halves mated up very well with the fuselage with very little sanding. 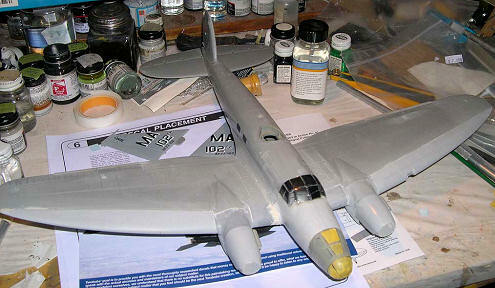 I fitted the bombardier’s pad after the clear nose was added, before I fitted the tip. The last major surgery was done on the wings. The entire leading edge is replaced along with the engine nacelles. One of the replacement leading edges in the set drooped at the end but hot water again straightened this warp out. This is another place where cutting less material away than recommended is preferred. Dry fitting the wing to the fuselage indicates where the new part fits in, as it lines up on the wing fairing. The engine cowlings are a direct replacement for the kit part. One of the inaccuracies I hear about from time to time is with the trailing edge. The wing should be elliptical on early HE-111s and this is not represented with the conversion set. The instructions show where to sand material off the aileron and to flatten the wing tip but it seems it would have been better to provide a replacement aileron as well. My hackjob got a heavy coat of Squadron white putty but in the end, most of it got sanded away as it all came together pretty well considering the extent of the alterations. After this, the horizontal stabilizer from the kit was fitted and I was ready for the paint booth. I can’t get away with a build without something going wrong and there it was. I’m still hoping someday I can find something to replace them with. In the meantime, it’s the worst that happened and I’ve found that I can live with that. Final assembly wasn’t much. Landing gear, propellers and lower gun position along with a few fiddly bits. The dustbin gun was the kit part with resin mounts. I kept this one clean because I wanted to represent a new plane and it’s easy to get gray too dirty. 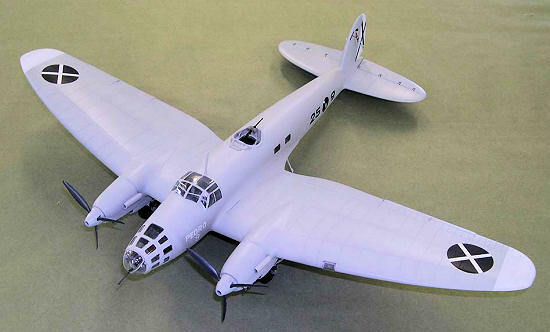 Having built Roden’s 1/72 HE-111A, this massive conversion was a welcome relief. I have always liked the lines of the early He-111 and having one on the shelf with the other 1/48 builds that dominate my collection is a thrill. So much so that this one continues to hold a place of honor in my display at my office. And I know it has an impact too. Last summer our representative with the Kriegsmarine was given a tour of our facilities and when he was led to the display in my office, he “ohh”ed and went straight for this one. This was an instance where the intimidation factor was outweighed by my desire to have one on the shelf. The “I” factor did draw this build out for about six months with all the “major surgeries” but in the end I learned that for the size of the undertaking, it wasn’t really bad at all. It will stretch your skills and give you a real feeling of accomplishment when it’s done. If you have this set collecting dust in the closet, consider making it a winter project. It’s worth it. History Of The World Wars Special: Bomber 1939-1945, BPC Publishing LTD.